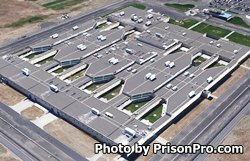 Two Rivers Correctional Institution is a mixed custody facility located in Umatilla Oregon that houses medium and minimum security inmates. This prison holds approximately 1,900 inmates. Two Rivers Correctional Institution participates in the Oregon Corrections Enterprise Industries, employing inmates in a sewing operation, in institutional and industrial laundry, a wood working shop, a custom furniture mill, and an upholstery shop. Vocational skills are taught to inmates in culinary arts, landscaping, and electrical wiring. Two Rivers Correctional Institution provides supervised labor crews for the surrounding cities of Stanfield, Umatilla, and Echo. Offenders can participate in parenting programs, adult basic education classes and obtain a GED during their incarceration. Additionally, inmates can receive medical, dental and mental health services. Visitation at Two Rivers Correctional Institution occurs on Wednesdays, Thursdays, Fridays, Saturdays, Sundays and Holidays from 7:40am-10:40am and from 12:40pm-3:40pm. The 2nd and 4th Wednesday of every month is only for special visiting.